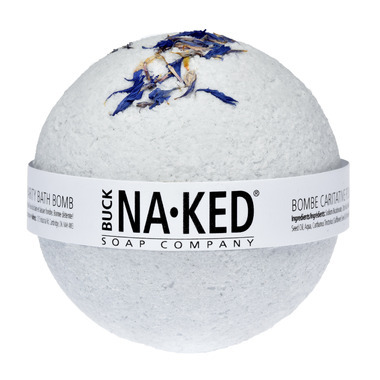 The Buck Naked Soap Company Bath Bombs are are the ultimate luxury! Each one has been designed to set a particular mood and create a calm and relaxing experience. They are a must have in your bathing ritual – and a great complement to the Buck Naked Indigo Charity Bar artisan soap. A portion of the profits for this bath bomb are donated directly to Sundara. Each year, 2.2 million children die from diseases preventable with proper hygiene. Buck Naked has partnered with Sundara to help empower women in vulnerable communities to make and distribute soap to impoverished children and educate them on the need for hand washing and good hygiene. A portion of sales from our Indigo Charity Bar go to support this initiative. To find out more, visit: www.sundarafund.org. Directions: Place bath bomb into bath and allow it to dissolve. Sit back and enjoy your bath! While our bath bombs are intended for one use, we encourage you to cut them in half or crush them to create a multiple use product. Discontinue use if irritation occurs.